Opening a bank account explains the advantages of having a bank account, and describes the different kinds of bank accounts, and how they work. Readers are also introduced to debit cards, credit cards and cheques, and technology such as smartphone banking apps. Why put your money in a bank account? How do bank accounts work? Cash and ATMs gives a short history of money, and explains how coins and notes came into use. It also explains how ATM machines work, and how to deposit and withdraw cash from an ATM machine. Manage your money explains the importance of saving, and how to draw up a budget. 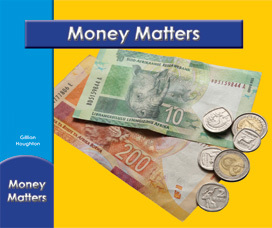 It also discusses ways of earning money, and shows how to spend wisely and bank one’s savings. Be a smart shopper explains how businesses compete for customers, and shows consumers how to buy goods that they need rather than want. It also explains the difference between goods and services, and shows consumers how to find value for money. I need it! I want it! How banks work explains what banks are, describes the different kinds of banks and banking, and the role of the Reserve Bank. It also explains how savings and cheque accounts work, and shows how compound interest increases savings. How do banks make a profit? Who works in a bank? How bank cards work describes the difference between debit cards and credit cards, shows the features of a bank card, and explains how to keep the card safe. Readers also learn about bank credit, and how a borrower’s debt increases through compound interest. Copyright © Awareness Publishing. All rights reserved.